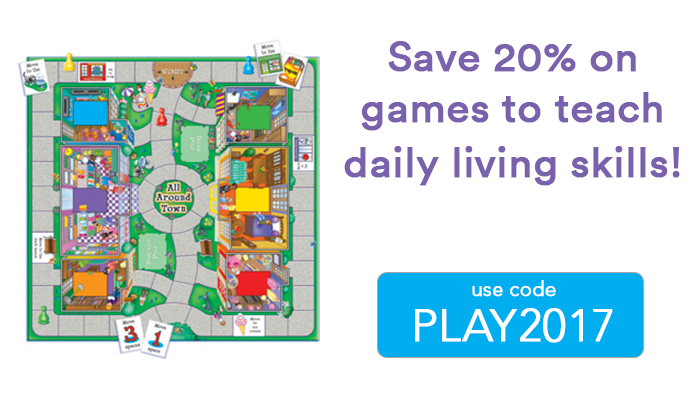 Pick of the Week: Save 20% on Daily Living Skills games! Help your learner navigate their town, shop for groceries and tell time with these fun and educational games! Written by: Different Roads to Learning on July 3, 2017. Last revised by: June 30, 2017. This entry was posted in ABA, Academics, Applied Behavior Analysis, autism, Autism Awareness, autistic spectrum disorder, Difflearn Promo Code, Pick of the Week and tagged activities of daily living, ASD, autism, autism spectrum, autism spectrum disorder, daily living skills, difflearn promo code, promotions, sales, sales and promotions by Different Roads to Learning. Bookmark the permalink.